Finally, the long awaited xposed framework for Android 7.0 Nougat has arrived. Rovo89 the developer behind the Xposed framework once stated that there was still a lot of work to be done in other to add compatibility for Nougat. Due to this reason, a lot of Android users who are running on Nougat have sort after for a way to get the xposed framework working on their device, but all efforts so far seems to prove abortive. 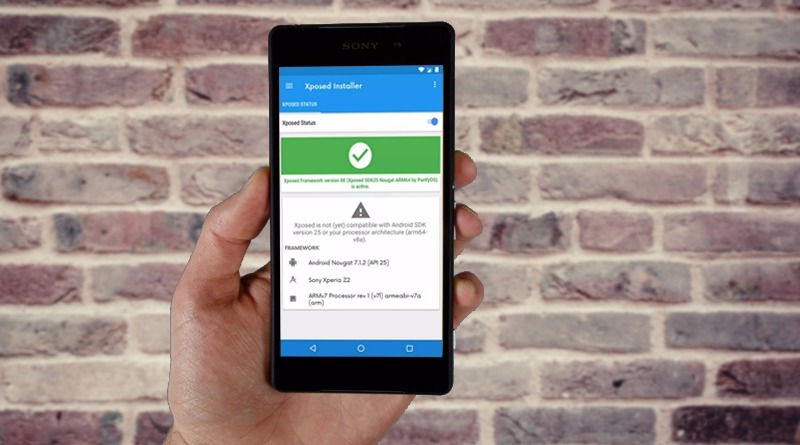 The good news however is that the team behind PurifyOS has managed to get their hands on abforce’s modular art of the original xposed installer, and after modifying it, they where able to port an unofficial xposed framework that can be installed via twrp recovery through a flashable zip. If you’re rooted and you have not heard of xposed framework before, then i guess you’ve been living under a rock. The xposed framework once hooked into your Android device, gives you the opportunity to customize your phone to the fullest with the aid of modules that can be grabbed within the xposed installer app. Now if your device is running on Nougat, and you wish to have xposed framework installed in it, then here’s how to get started. Note that in some cases, your device may not boot after installing xposed. So ensure you’ve a recent NANDROID backup that can be restored incase you are faced with a bootlooped or soft bricked​ device. Remember that techviola won’t be held responsible if you brick your device during this process. To begin with, make sure you have enabled installation from Unknown Source on your device. To do this, head over to Settings and then Security. From here, simply toggle ON the option. Then download and install the xposed Installer apk from here. Don’t open it yet i.e if necessary, since it’ll be used to install and manage modules. Next, you’ll need to download the flashable zip file of xposed framework. But before we dive into this, you should know that xposed framework has 3 different versions designed for a specific CPU architecture. To see the kind of processor your device have (i.e ARM, ARM64, or x86) simply download CPU-Z. Once you’ve figured out your device’s CPU architecture, download Xposed framework zip from here. Now reboot your device to twrp recovery or any custom recovery that you already have. From here, make sure you’ve a NANDroid backup on standby, then if you’re using twrp recovery, simply tap the “Install” button and navigate through your device’s folder. Then locate and select the xposed framework zip file you downloaded earlier on, and swipe the slider at the bottom of the screen to flash the xposed framework.zip file. Once you are done, ensure to “Wipe Cache/Dalvik”, then reboot your phone. Enjoy Xposed Framework On Android Nougat. Once your​Android device is back on, simply open the xposed installer app, and you will notice that the xposed framework has been installed successfully. To test things out, go to the Download section in xposed Installer app, then search for any module you wish to install. Download and install it on your device, then enable it via the Module section in xposed installer app and perform a soft reboot afterwards. That’s it. Also keep in mind that a few number of modules needs to be updated to support Android Nougat. Although there are dozens that are already compatible. 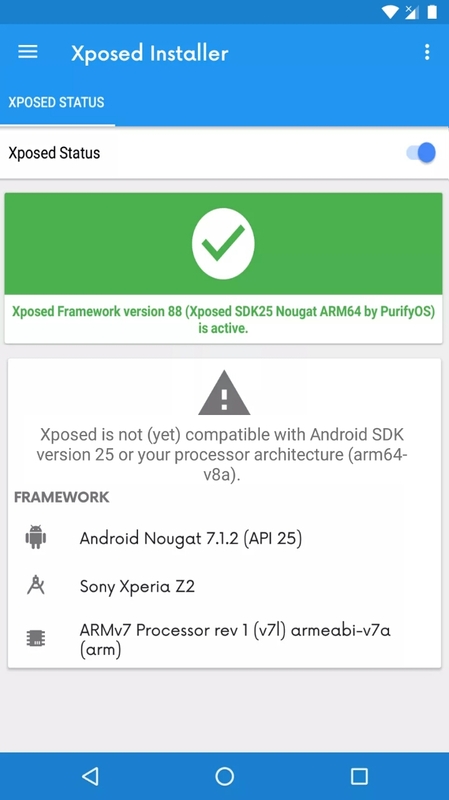 If perhaps you get a message saying that “xposed is not(yet) compatible with Android SDK version 25 or your processor architecture”, simply ignore this, as it’ll still work.